Bobs creativity, his spirit, his vision, and his meticulous nature are reflected in the schematics he created, and those created from his work. They are a documentation of the history and progression of his innovation in an artistic and beautiful format. View original schematics from the Foundation archive, some hand-drawn by Bob himself, here. Final Assembly Percussion Controller schematic: This mechanical drawing is from the 1973 Moog 1130 Percussion Controller, showing the assembly of the final unit and giving hints to its operation. The 1130 converts the physical impact of the drum head being hit into a voltage output that can be used to control any voltage-controlled aspect of a Moog modular, or any device that responds to changes in voltage. The prototype of this device can be found in the Bob Moog Foundation Archives. The Bob Moog Foundation received two preservation grants from the GRAMMY Foundation which enabled the restoration of 88 rare reel-to-reel tapes from from the late 60s and 70s. Read more about his effort here and here. Our paper archives are stored in the NC State Archives, a state-of-the art facility in Western North Carolina. 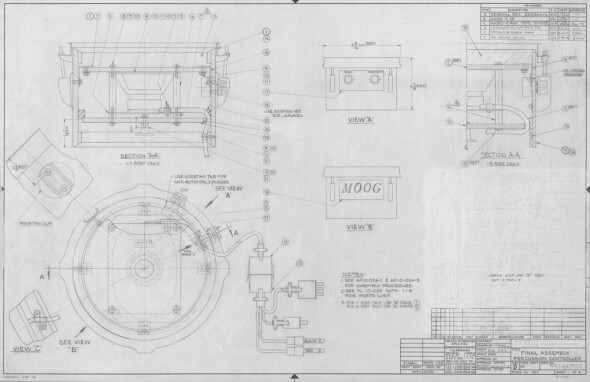 We have inventoried and archived over 1800 schematics documents, some hand-drawn by Bob himself. We exhibit archival materials at regional and national music festivals, with partner museums in exhibits like Switched-On: The Birth of the Moog Synthesizer and Waves of Inspiration: The Legacy of Moog, in our own MiniMoogseum, and online, exposing them to tens of thousands of people of all ages. The Bob Moog Foundation Archive is an extensive, historically rich and culturally significant body of materials representing 50 years of pioneering efforts. It offers a fascinating glimpse into the Moog legacy. We are committed to preserving the information in this archive for generations to come. The materials included here will form the core of our historical exhibits at our future Moogseum. To help us preserve and share these archives, donate here.